Tabouleh Heights expired in the 1950s to make way for a tall apartment building followed later by the five star Cairo Sheraton Hotel complex. As one by one the great mansions beyond Tabouleh Heights also started to disappear, an important piece of Cairo's history was irrevocably forsaken. During the 1930s heyday of Egypt's economic and cultural liberalism, the riverfront stretch south of the land now occupied by the Cairo Sheraton Hotel had matured into an exclusive suburb west of Cairo. The new row of stately mansions and gardens overlooking the Nile occupied what had heretofore been part of Khedive Ismail's estate, which included his Giza palace and gardens. While the first had been designed by the Italian architect Guissepe Garozzo, the parks and gardens were conceived by Barillet-Deschamps, the famous 19th century landscaper whose gardens and parks still adorn Paris today. Following Ismail's exile and the subsequent privatization of his landholdings the Giza estate was carved up into the Giza Zoo, the Orman Gardens, and the precursor of what became Fouad al-Awal (now Cairo) University. As for the suburban section of Giza, this was commercially launched in 1904 by the Giza and Rhoda Land Company belonging to the ill-fated Zervudachi-Rodocanachi venture. Failing to live up to its ambitious blueprint, the company ended in disaster with one of the partners committing suicide sparing himself financial embarrassment. The first significant change to Giza's skyline took place in February 1908 when two bridges, one linking Rhoda Island with Old Cairo and the other linking the island to the Nile's west bank, were inaugurated by Ismail's grandson, Khedive Abbas Hilmi II. The second wave of changes came after the inauguration in August 1912 of the Attaba-Pyramids tramway route by way of Zamalek and the Zoological Gardens. Both events led to the rapid development of Giza's riverfront when the first set of villas appeared on the banks of the Nile. These handsome new structures were the envy of Cairene society, for the proud mansion owners represented the mosaic that made up Egypt's wealthy urban class. Not only did they comprise landed gentry, pasha-politicians, Syrian entrepreneurs, Jewish bankers and department store owners, but there was the eccentric royal, the court doctor, a poet laureate, several art collectors, a cabaret entertainer and an international movie director. Conspicuously absent, however, were the Franco-British civil servants and administrators who had become an integral part of the Egyptian social landscape. A group of post-Victorian Anglos continued to run the country even after Britain had formally ended its Protectorate over Egypt in 1922. 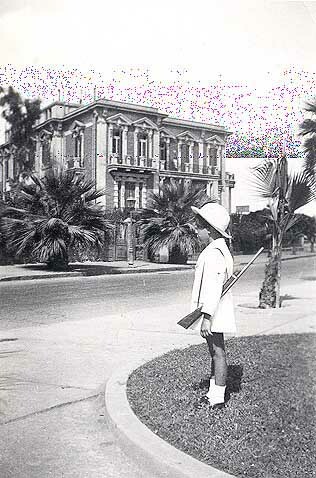 They lived in semi-isolated communities, preferring the island of Zamalek and the floradora of Maadi. Both sites boasted that most famous of English institutions -- the Club, with its cricket pitches, tennis courts and golf courses around which fellow faces could enjoy afternoon tea, cucumber sandwiches and buttered crumpets. The first official detail of starched French diplomats arrived in Giza as late as 1936. In the meantime, la belle France was invariably represented by a contingent of midinettes who under normal circumstances would never have afforded an attic overlooking the Seine in Paris let alone play society hostess in beautiful mansions overlooking the Nile. The dream became a reality when the French Suzettes married student-scions of influential Egyptian pashas and rich beys on state-sponsored or private scholarships in France's universities. At first there was no corniche on this stretch of prime riverfront so that mansions and villas had immediate access to both the Nile and the colorful dahabias, or houseboats moored on its bank. This privileged situation ended when town planners, armed with slide-rulers and drawing boards, traced a new Nileside road. A Giza riverside drive was put to execution so that lesser Cairenes could enjoy a wonderful Nile side promenade which allowed them a glimpse of how the bold and the beautiful lived. As though to indicate the developments that overtook Egypt during this century, the name of the new drive changed several times. From al-Bahr al-Aazam, meaning 'great sea' a reference to the Nile's titanic summer floods, the name was changed in 1936 to King Farouk Avenue, commemorating Egypt's new monarch. But like all monuments and edifices named after royalty, these were changed in the wake of the 1952 military coup that toppled the king and his wobbly throne. New names were drawn from an unoriginal list: Gamal Abdel Nasser, Tahrir, Gomhouriya , Nasr. In this particular case, King Farouk Avenue became Gamal Abdel Nasser Street. But, for some unknown reason, the new name never caught on and reverted to the original with a slight variation. Since the 'great sea' had been irrevocably tamed by Aswan's High Dam, the 'great' would have been a misnomer. Sharia al-Nil or Nile Street was sufficient. Had a confused citizen mailed a letter to Anwar Sadat in the '70s, he would have addressed it: "President Anwar Sadat, No. 82, Gamal Abdel Nasser Street, ex-King Farouk Avenue, Giza". Five decades of history on the back of an envelope! Closest to Pont des Anglais, which understandably changed its name to Evacuation (Gala'a) Bridge after 1952, stood the imposing homes of prominent Jews including two Mosseris, a Smouha, Ralph & Alexander Greens, palace jeweler Meyer Eliakim's and businessmen Charles V. Castro. The tip of the stretch however, was reserved for a disparate coterie of Syrians most of whom hailed from Damascus, Aleppo and Beirut. Hence the nickname of 'Tabouleh Heights' reference to the popular Shami mezze. It was in 1926 that Damascans Naguib and Latif Sobhani commissioned Italian architect Domenico Limongelli to build them a three-story apartment building. While half the building was occupied by Sobhanis, the remainder was leased to Syrian architect Antoine Selim Nahas, Coptic magistrate Maitre White Ibrahim, director of the La Genevoise, Dr. Georges Vaucher, and later, to Sobhani Bey's son in law, a member of the Totounji clan from Aleppo. There were also several English tenants who succeeded one another. One of them, Major Long of the Royal Air Force, was, in a way, responsible for the make-up of the surrounding area. Having crossed Pont des Anglais into Giza commuters inadvertently come across a large ditch. Following the exceptional floods of 1926-27 this was filled with water which meant motorists had to detour through Dokhoulia Alley. Displeased with the situation, Major Long, who enjoyed considerable influence with the British-dominated administration, contacted the ministry of public works. The latter promptly proceeded to fill the ditch with gravel so that the situation was quickly rectified. Just north of the Sobhani Building, across al-Dokhoulia alley, was where another Syrian set up house on land belonging to Selim de Saab, a Syrian ennobled by the Pope, hence the honorific 'de'. But this was not to be your typical family homestead for the new arrival was none other than the celebrated Madame Badia Masabni or "Bada'da, as Egypt's unchallenged cabaret queen was often called. . Yet even the queen of showbiz needed the necessary permits before she could open her night club for this was a strictly residential area. Which is why the diva contacted Naguib Sobani Bey soliciting his support. His condition: All music and accompanying commotion had to end by 23:00. Giza's celebrated Music Hall - Casino Badia - made world history during WW2 when officer, swindler and spy intermingled under the comforting 'torpedoes' of al-Set Badia's famed dancers. Failing to win her over, Hitler's propaganda machine found it necessary to attack Madame Badia accusing her in turn of being a traitor, a dangerous spy and a British secret agent for it was common knowledge that Churchill's son and the Duke of Gloucester had capered in her Casino. Even before the war, Badia's famous dance halls -- successively on Emad al-Din Street, Opera Square and Tabouleh Heights -- were considered part of Cairo's cultural landmarks. These were launching pads for many a dancer, singer and performer. Both the Druze-born crooner Farid al-Atrash (who would eventually own a post-WW2 building on Giza's riverside drive) and Assyrian comedian Naguib al-Rihani took turns turn on Badia's stage. In fact, Rihani alias 'Kesh-Kesh Bey', became Badia's long-time and only husband. 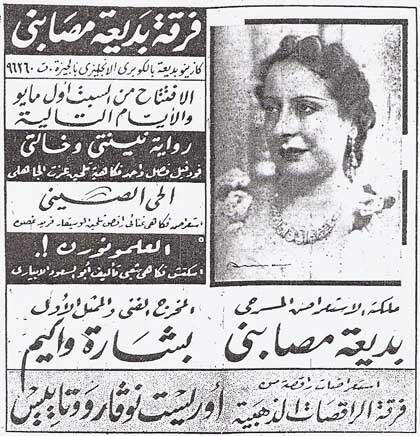 It was also from Badia's stables that famous belly dancers like Samia Gamal, Beba Ezzedine, Tahia Carioca, Hekmat Fahmi and Safia Helmi began their fleeting careers so that Casino Badia lived on even after Cairo's primo belly dancer reluctantly relinquished her lease to a hated rival. Debt-ridden and hounded by tax collectors, the downcast Badia escaped to Lebanon where she eventually settled down and ran a chicken farm in Chtura, not far from the Syro-Lebanese border. It was Safia Helmi who carried Badia's legacy into the '60s from her own dance hall on Opera Square. Like its predecessor on the Nile, Casino Safia Helmi's was a sunny spot for both shady and intellectual personalities. Neither Villa Sobhani nor Casino Badia are still with us today. Villa Sobhani was demolished in the 1950s to make way for the Mirshak Building belonging to the family by the same name. Like the Sobhanis, the Toutounjis and the Masabnis, the Mirshaks were of Syrian stock. Relative latecomers to this corner of Giza, the Mirshaks built their post-WW2 villa on a plant nursery which separated the Sobhanis from their Jewish Mosseri neighbors. When a few years later the Mirshaks purchased Villa Sobhanis, they replaced it with a ten-story building. In view of its size, it meant sacrificing part of their garden. Like Villa Mirshak, the Mirshak building was also designed by Syrian architect Antoine Nahas, formerly of Villa Sobhani. The departure of the Mirshaks following the 1961 sequestration decrees by a state gone socialist signaled the gradual transformation of the riverfont's ethnic mix. For starters, the land which had accommodated Badia's casino in summer and a popular skating rink in winte, became in turn the property of King Feisal of Saudi Arabia and later the home to Cairo's first Sheraton hotel. Ironically, none of the hotel's night clubs, bars or cafés bear the name of Badia. Villa Mirshak was purchased by a member of the Kuwaiti ruling family. For its part, the Mirshak building was sequestered by the state and partly 'squatted' on by a different set tenants represetning a mix of Egyptian bourgeoisie and Gulf money plus the odd social climber who had pandered to the state. Looking back, it was as if Arab Gulfies had replaced the Nazarene Syrians. A trend that would be repeated again and again as one traveled south of Tabouleh Heights, down Giza's most coveted riverside drive.